Bihar School Examination Board (BSEB) is all set to begin the applications for Teacher Eligibility Test (TET) from date 6th April, 2018. Bihar TET is conducted for such candidates who want to become teacher in government schools. Large number of vacancies is open to invite deserving candidates for the job of teacher (Primary and Junior Level). The test takes place to provide certification to qualified candidates for the eligibility in teaching sector. The exam doesn’t mean for confirmation of seat in any government school. It simply means that a candidate is eligible to become teacher in any school in state of Bihar. Here you will get main info of Bihar TET 2018 Latest News, Bihar TET Online Application Form 2018, www.bsebonline.net Bihar TET Official Website, Bihar TET Syllabus 2018, Exam Pattern for Bihar TET Exam 2018. Online applications are available on official website of the board with all the details required to follow in order to appear for the eligibility exam. 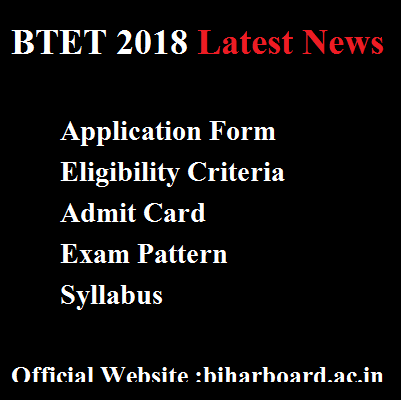 In this article we have also provided all possible information about the BTET exam 2018 regarding the Important Dates, Eligibility, Age, Exam Pattern/ Syllabus etc. We hope the below given details may help you in BTET Exam 2018. Candidates are also advised to visit the site for more updates on the exam. Educational Qualification – Candidates must meet the qualification requirements in order to apply for the exam. Below given are minimum educational qualifications for primary and junior level. Primary Level – The candidate must have passed Intermediate exam with minimum 50% marks with Bachelor in Elementary Education final year or Intermediate exam with minimum 45% marks and 2 years of Diploma in Elementary Education or Intermediate exam with 50% marks and 4 years of Diploma in Elementary Education or Intermediate exam with 50 % and BTC/SPBTC Exam. Junior Level – The candidate must have bachelor’s degree BS/B.Sc with two years Diploma in Elementary Education or Bachelor’s Degree in any stream with B.Ed or one year in B.Ed with minimum 45% marks as per NCTE norms. Selection Process – The candidates will get selected completely on the basis of written entrance exam. Eligible candidates can apply for BTET 2018 exam via online mode by visiting the official website of Bihar School Education Board that is, bsebonline.net begins from 6.4.2018(expected dates) onwards. Now on the home page click on the link ‘Bihar TET 2018 Apply Online’. On new page the application form will display. Now fill up the details like Name, Qualification, D.O.B, Address etc. in appropriate spaces. Now pay your application fee category wise via online. Check the details before final submission. Now save or take hard copy of Application Form for future use. Finally we have provided info regarding Bihar TET 2018 Latest News, Bihar TET Online Application Form 2018, www.bsebonline.net Bihar TET Official Website, Bihar TET Syllabus 2018, Exam Pattern for Bihar TET Exam 2018 which available in pdf.